Following a trinity of 12-inch singles on Vanity Case Records where extended psychedelic reworkings of tracks by Can, Funkadelic and Hawkwind were backed by original compositions, Psychic TV return with their first full length album since Mr. Alien Brain Vs. The Skinwalkers and it's a pretty good if something of a straightforward listening experience. It's also a more well rounded effort than the previous PTV3 albums, Hell Is Invisible...Heaven Is Her/e and Mr. Alien Brain Vs. The Skinwalkers. 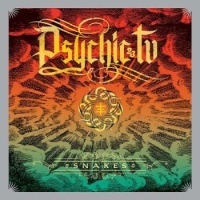 Comprising the same line-up that appeared on three Vanity Case releases, it touches upon the history of Psychic TV with some tracks that bathe in the hyperdelic era glow and others that channel Genesis Breyer P-Orridge's kindred spirits such as Joy Division and musical roots such as Pink Floyd, together with some mystical space rock explorations. Several tracks seem inspired by Genesis Breyer P-Orridge's trip to Benin, to explore the truths and origins of Vodun (Voodoo, Voudou, Vodoun) which forms the subject of Hazel Hill McCarthy III's forthcoming documentary, film Bight of the Twin. Snakes has some fine moments and is far better that what I'd been told to expect. "I live a life doing what I want to" sings Breyer P-Orridge on the opening track, 'After You're Dead, She Said', which could read as a mission statement in itself for the life of Genesis Breyer P-Orridge. Plundering bass and drums from Joy Division's 'Atmosphere' overlayen with melodic keyboards creating a tender moment to Gen's reflective lyrics, before guitars burst forth accompanied by violin. It's another of those rare little Psychic TV pop gems don't unearth as often as they should, with a title which could even allude to something said by Gen's late partner Lady Jaye - and partner in their pandrogeny project. It's followed by 'In Solitude Of Memory', a short experimental ambient interlude woven with a sample, that leads into 'Burning The Old Home' which continues the expansive acid jams of the Vanity Case releases, featuring the stellar guitar work of Jeff "Bunsen" Berner. Here amidst tumbling notes and slide guitar touches, Gen's ritual inflected lyrics evoke the divine with mystical and magickal imagery littered with references to tantrism, priestesses, hierophants, dreams, and ego, while the piano tinkles and violin sways in folk fashion. And then Berner's wah-tinged guitar flourishes soar into a mystical space rock explosion. There are even throwbacks to early Psychic TV in lyrics about "seeds ejaculating" and when s/he sings of "old ego" an age-old Manson song is brought to mind. '(It Was) Never Enough' which opens the second side pulsates with the hyperdelic glow of old live PTV merging bubbling electro beats with PTV rockisms with some simple lyrical dexterity from Genesis Breyer P-Orridge. On 'Snakes' they dispense with the guitars for hand percussion and shakers with Genesis in more sinister mood intoning "keep the snakes inside the glass, see the way life can pass, drink the life inside the glass', shrouded by theremin wails, effects and feedback. The track is based on Genesis' trip to Benin, as part of Hazel Hill McCarthy III's forthcoming documentary feature where they participated in a ritual, imbibing a shot from a big glass jar filled with dead pythons and chameleons floating in some clear liquid, followed by licking both black and white powder from the floor resulting in a delayed psychedelic experience. The final section of Snakes moves from 'Thee Mountaineer' where flickering bluesy guitar structures, merge with violin scrapes and the hoarse tones of Gen. The whole thing sounds like an experimental take on the Tom Waits album 'Real Gone', which in itself was primed on industrial sounds, before letting loose with the powerful drumming and atonal effects of 'Project! Expect!' which segues nicely into the overtly Pink Floyd inspired 'Overdriven Overlord' which in fact is a free form amalgamation of 'Interstellar Overdrive' and 'Astronomy Domine' with Genesis relating the lyrics of the latter to the tune of the former. This one would have been ripe for a fourth Vanity Case release but here with Gen intoning the names of planets complete with Pink Floyd organ chime and Jeff Berner's space rock guitars it's whittled down to something just short of 5 minutes. It's a shame as this could have been something far more substantive but with lyrics about "icy waters" it does provide a tenuous link between the opener and Psychic TV's Ian Curtis tribute 'I.C. Water'. Further associations to the past are found on the Jim Morrison inspired 'LA Angel', which forms one half of a bonus 7-inch single backed by the whimsical experimentalism of 'Phil-Thee' that comes with the first 320 copies of Snakes purchased directly from Angry Love Productions.On this psychedelic space rock studio take of the track that previously featured on such live albums as Live In Toronto and Live in Astoria they tackle the destruction of the creative spirit lyrically entwining the death of the lead singer of The Doors with the hallucinogenic drug, angel dust.